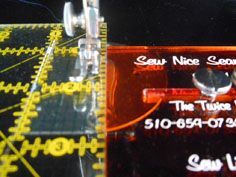 The Sew Nice Seam Guide was developed primarily for use on a Singer Featherweight sewing machine. However, it has also been used successfully on a Juki machine. All you need is to have two screw holes on the bed of your machine. Two thumb screws come with the guide to hold it securely in place. Simply align a ruler with the needle to the size of seam you want. Put the pressure foot down to hold in place. Next lay the guide against the ruler and secure with the two screws.